The calendar still says summer, but in many places, it’s starting to feel more like fall. Kids are back in school, Labor Day celebrations are behind us, and the flowers of summer are starting to look a little bit past their prime. There are still plenty of butterflies and hummingbirds around in most areas, though, so don’t let your garden die back too soon! There are a variety of great nectar plants (the plants that butterflies and hummingbirds feed on) that bloom their best when the days begin to get shorter. Try adding some of my favorites to your garden this fall – all of these are perennials or re-seeding annuals, so they’ll reward you for your efforts now and in the years to come. 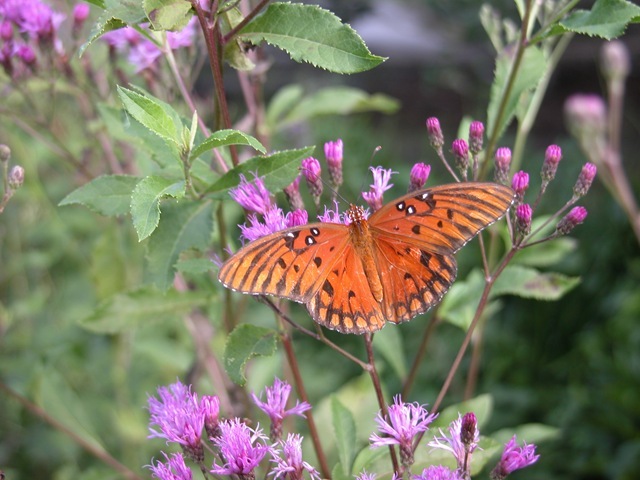 Ironweed (Vernonia spp.) – This towering fall wildflower starts blooming in late summer all over the country. There are many different species; seek out those native to your area to find the best fit. Goldenrod (Solidago spp.) – Goldenrod gets a bad rap, with people blaming it for seasonal allergies. In truth, very few people are actually allergic to this wildflower. Instead, they’re allergic to ragweed, which starts blooming around the same time. Plant all the goldenrod you want, with no fear of sneezing! Canada Goldenrod (Solidago canadensis) is native to much of the country, but seek out other varieties native to your area too. The tall yellow spikes of this plant pair perfectly with the purple stems of ironweed. Aster (Aster spp.) – Fall blooming asters are one of the best nectar plants you can add to your garden. Carolina Aster (Aster carolinianus) is one of my favorites down south, but in other areas you should focus on your own native selections, like New England Aster (sometimes called Michaelmas Daisy) or California Aster. Blazing Star (Liatris spp.) – Another tall wildflower boasting stalks of purple, Liatris species are an especially good draw for butterflies as fall continues. The tiny flower heads are perfect for tiny butterflies, but bigger species enjoy them too. There are 37 species of blazing star, so you’re certain to find one or more that will work well in your own garden. Pineapple Sage (Salvia elegans) – Salvias of all kinds are usually great for butterflies and hummingbirds, but the great thing about Pineapple Sage (aside from its foliage, which does indeed smell like pineapple) is the fact that it starts blooming when other plants are done for the summer. In fact, Pineapple Sage is light sensitive, and will not bloom until days are generally shorter than nights. This may make it too short lived in some northern areas to be worth the trouble, but those in milder climates will find this to be a great addition to the garden. Mexican Sage (Salvia leucantha) – Mexican sage is another fall-bloomer that may be best for warmer climates. The foliage and flowers will be damaged by frost, and a sustained hard freeze will kill this plant entirely. In warmer areas, though, this champ blooms from late summer through to the following spring, and hummingbirds love it. There are plenty of other fall nectar flowers to add to your garden – which ones are your favorites? Tell us in the comments below! Awesome, great selection of plants to be on the look for and reinforce our gardens. Had a hummingbird October 28th last year at my pineapple sage. Took till September to bloom but still think it was worth my last summer thrill! I live in Michigan and that’s almost unheard of! Wow…another one of my images. Thanks so much! (The hummingbird with pineapple sage. Very late blooming flower. Great for fall migration.